Tonight made for a proper sunset. The essential cadre rolled deep and even brought the support staff. 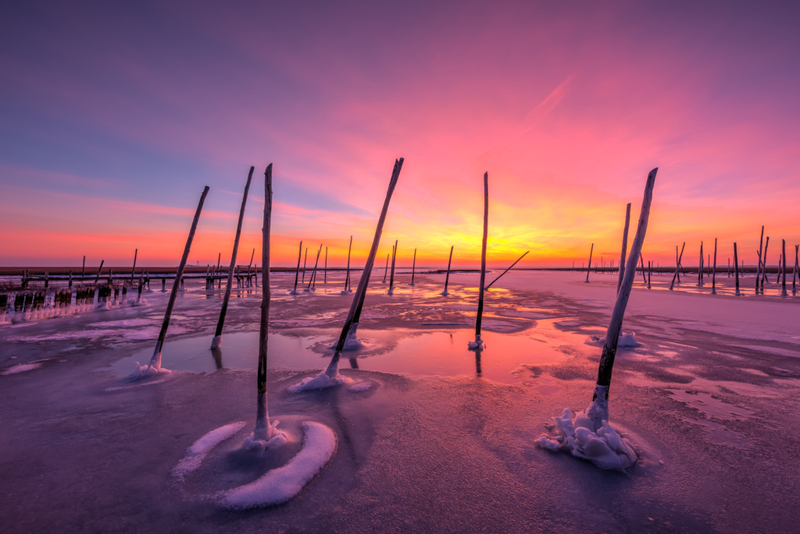 There was snowpack, sea ice, disused dock pilings, and a painted reflection brushed by a solar goodbye burning out slow with smoldering intensity. It was fantastic. Sure the temperature was biting and the wind unforgiving. Of course leaving the house with a pair of gloves would have made perfect sense. Hey, even a woolen hat would have proved wise. Yet when the ice world ignites the fire inside burns passion red. This is winter at the beach. This is when the power sunset hits, when the seascape on our eastern flank locks in ice and casts a panoply of color. The marshes, bays, and coastal ways captured by cold, locked tight to the landscape despite battle from tidal forces. The power needed to freeze the land and stem the tide is striking. Cold, weather, nature—it all means business. A reminder of impermanence and subordination to big ‘N’ Nature. Cold as I was, I was beyond pleased to be out exercising camera tactics amid the cold splendor. It was obvious this was the best shooting conditions I’ve encountered in months, even longer. The most promising since late last summer when I made a bunch of great shots only to have a corrupted file transfer render all data unretrievable. That moment had left a sour taste in my mouth for months. This evening cleansed the palette and froze it all away. After a low output 2018, I am pleased with efforts and outcomes in 2019. I committed to making this a better year for my photography. I am delivering against the commitment. Writing about it here helps hold me accountable. It makes it more real. A commitment to myself and to you welcomed website visitor. Yes, you. With any luck it is a touch warmer where you are at, and you were able to enjoy this photograph in comfort. Cheers, and thanks for your support and attention.